Drive down Crosman Terrace, located in the Upper Monroe Neighborhood, and you will be delighted to experience one of the city’s most attractive early 20th century residential streets. Its name is linked to the Crosman Seed Company, which was founded nearby on Monroe Avenue in 1838 by Charles Frederick Crosman. The company maintained seed beds throughout the Rochester area, as well as in Canada and Michigan, and was once one of the largest seed companies in the world. Today, the Crosman Seed Company still operates in nearby East Rochester as one of the nation’s oldest seed companies. The house at 215 Crosman Terrace exemplifies the many quality-built homes from the 1920s and 30s found on this tree-lined street. 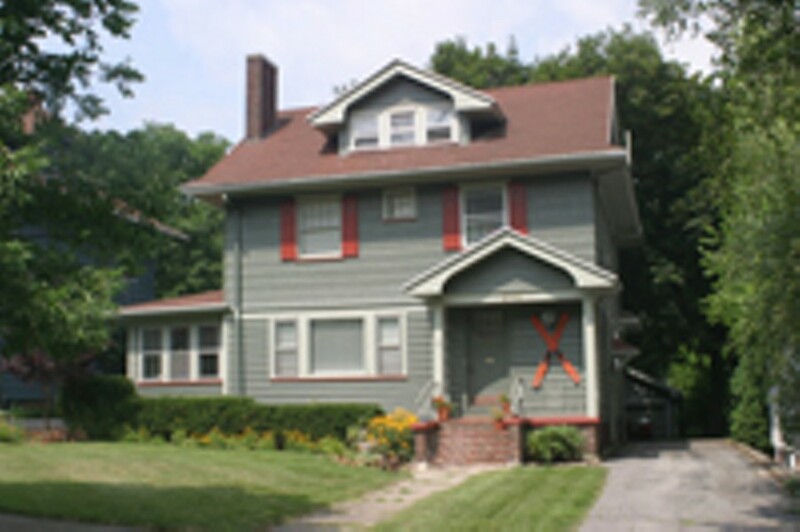 The pleasant exterior with its front entry porch, center roof dormer, and broad eaves is reminiscent of the popular American Four-Square style homes that grace many of our city’s neighborhoods. An interesting visual component is the combined use of wood clapboards on the first floor and wood shingles arranged in a banded effect on the second floor. Inside, the two-and-a-half story, 2220-sq.-ft. residence features polished oak floors and leaded-glass windows. The entry hall, which has a door to a diminutive powder room, opens into the spacious living room, made bright by the large three-part front window. At one end of the room is the wood-burning fireplace, with a pleasing paneled wood mantel and built-in cupboards and open shelving beside it. A handsome leaded-glass door opens into the former sun porch, now enclosed and used as a child’s play room. Next to the living room through a wide opening is the formal dining room with double glass doors that open onto a large outdoor wood deck overlooking a back yard shaded by mature trees. The ample-sized kitchen is next to the dining room and contains a convenient island with an eat-in bar, cook top and cupboards; the oven and microwave are built into the wall. A large picture window provides another view into the yard. Behind closed doors is a laundry area. 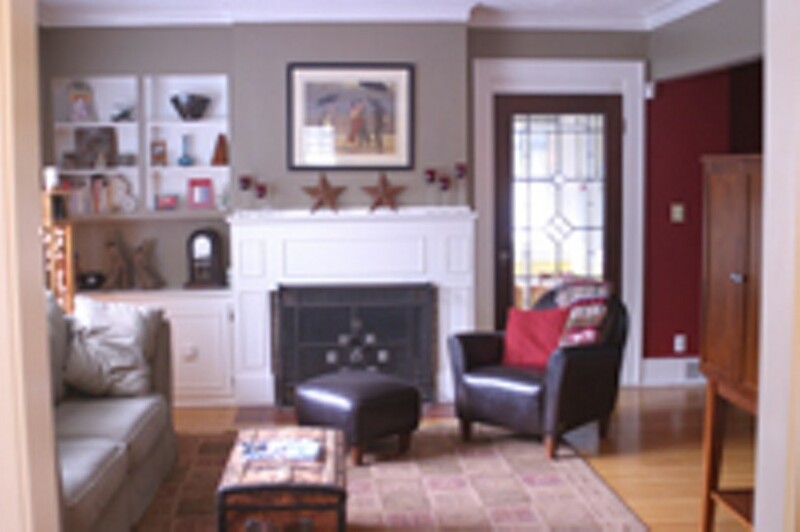 Upstairs is a wonderful master bedroom with a significant sitting room area and plenty of built-in cabinets. The large full bath features black and white floor tiles. 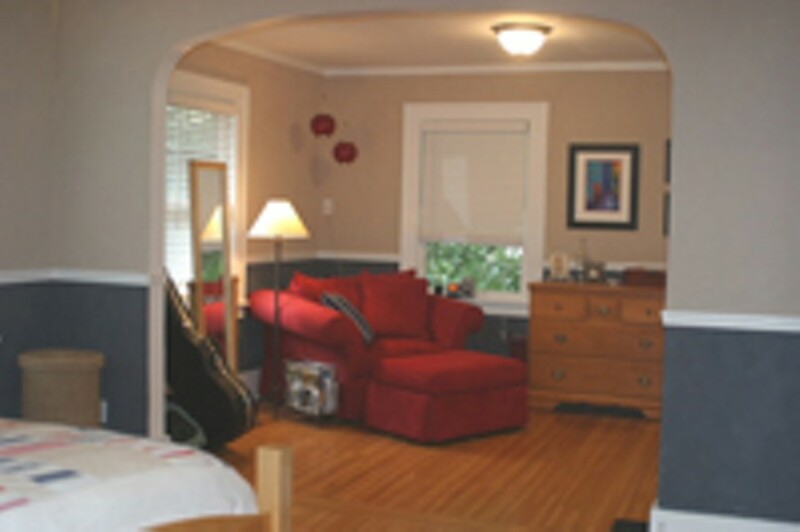 Two additional bedrooms include one adapted from a former sleeping porch. The third floor space has been recently refurbished as the current owners’ offices and includes the main open area, a smaller room, and a full bath, all well-lighted by full-size leaded-glass windows. A double-wide driveway leads to the detached two-car garage at the rear of the .18 acre lot, which is partially fenced. The amenities of the neighborhood are rich and varied. Crosman Terrace skirts the foot of Pinnacle Hill; Cobbs Hill and Highland Parks are within an easy walk, as are the Monroe Branch Library and the YMCA Monroe Branch. The active Upper Monroe Neighborhood Association keeps neighbors informed and involved with monthly meetings and seasonal events. Of course, with the I-490 access ramp just around the corner, it’s an easy jaunt to downtown or to the suburbs and beyond. This fine, well-maintained property is being offered at $199,000; taxes are $5,674. Contact Joseph Rinaudo, at REMAX Gold, at 244-4653.